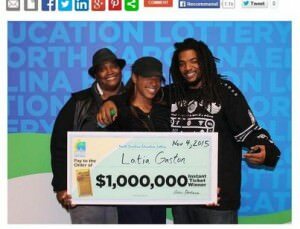 When her mother suggested she buy one of the new scratch tickets of the North Carolina Education Lottery, Latia Gaston of Gastonia followed the advice. She dutifully bought a $10 “Holiday Gold” instant lottery ticket from the Kangaroo Express on East Franklin Boulevard. Best of all she asked her mother Josetta to scratch it. The instant ticket revealed a $1 million prize. Given a choice between 20 annual installments of $50,000 and a single payment of $600,000 she chose the latter. Her take home prize comes to about $415,503 net of state and federal taxes. She shares that the money will allow them to expand their charitable giving during the Christmas season.